How should you go about picking the right fishing boat? Plainly, any floating platform can be used for fishing. Anything from a kayak to a bow rider, a sports cruiser or even a superyacht will do the job. 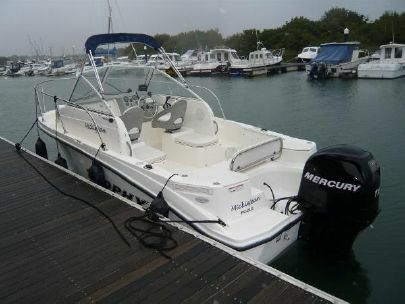 But while a simple and very affordable outboard-powered runabout might be perfectly adequate for a spot of modest inland angling, more adventurous sea fishers have a more stringent set of criteria when it comes to buying a fishing a boat (read Fishing boats: a buyer’s guide). 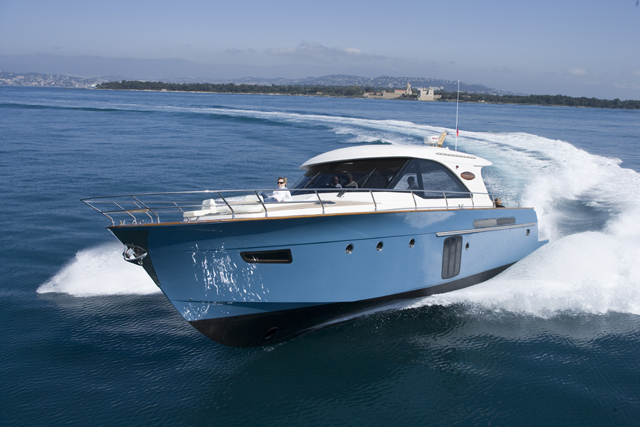 For a start you want greater size, cruising range and seakeeping ability. In terms of hull design, you also want a broader beam - not just for extra internal space but also for better stability at rest. The aggressive handling dynamics so enjoyed by the purist sports boater are far less relevant here. 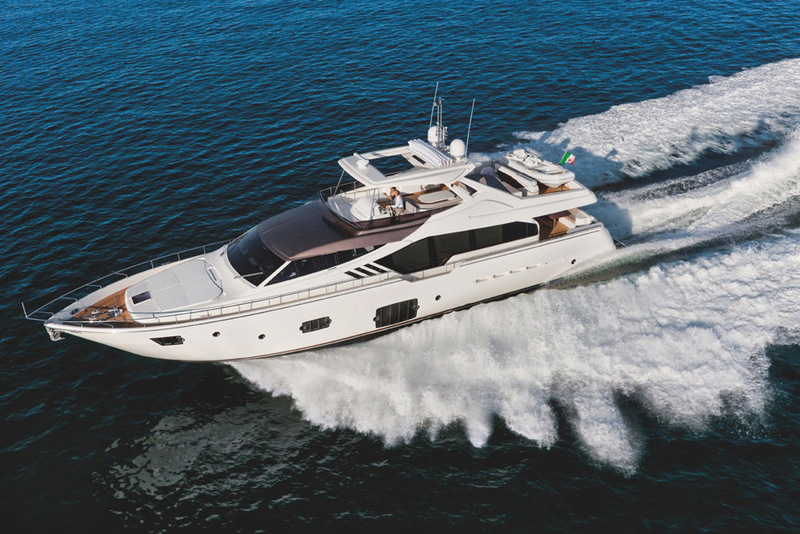 Instead, you want a generous bow flare to help protect the occupants from spray and a central helm (usually in "Wheelhouse" or "Centre Console" format) to provide shelter from the elements without inhibiting deck space or on board movement. An acutely angled forefoot to help soften the impacts is certainly useful on a serious sports fisher but the bow should also possess sufficient breadth and buoyancy to resist a stuffing when at slow speed or off the plane in lumpy troughs. 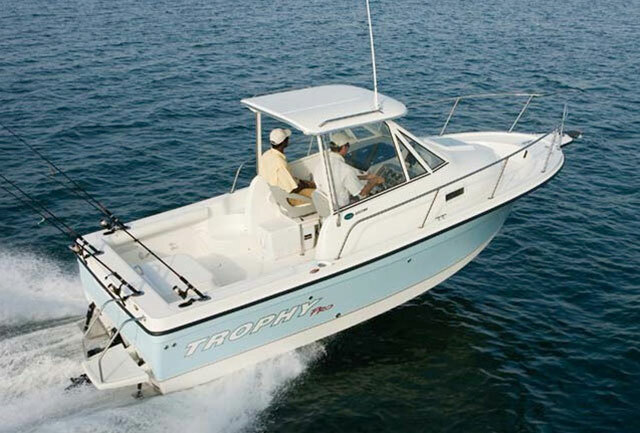 As a sports fishing boat specialist, Trophy remains a great brand for do-it-all sport fishers at affordable prices. There are only two formats available (centre console or walkaround) and the 2152 WA is a conspicuous highlight. Despite being the second smallest of the four walkaround models, this broad, easy riding, well built fishing boat comes with a simple cabin to stow bulky gear or to get your head down. It also has impressively wide walkways for safe access to the bow. In addition to a beam in excess of eight feet and a usefully deep freeboard, you get a 60-litre aerated livewell, a generous array of rod holders, a pair of drained fishwells, a bimini top and a cooler. 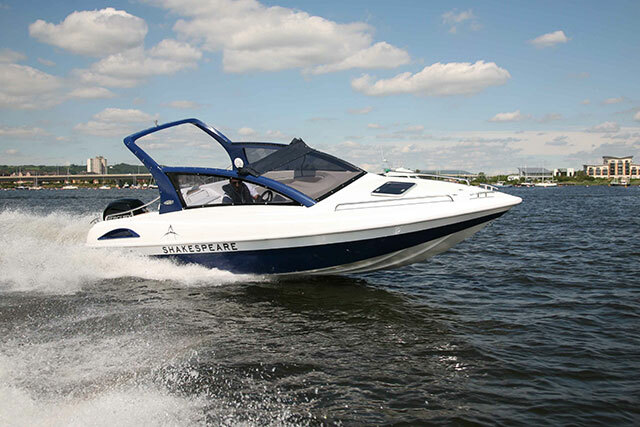 With the 120hp diesel engine in place, you can expect 30mph allied to an excellent range in excess of 430 miles – and while it lacks the more exclusive features of the high-end models (trim tabs, portable head, stereo system and swim ladder are all optional) it is easy to see why it remains Trophy’s most popular boat. 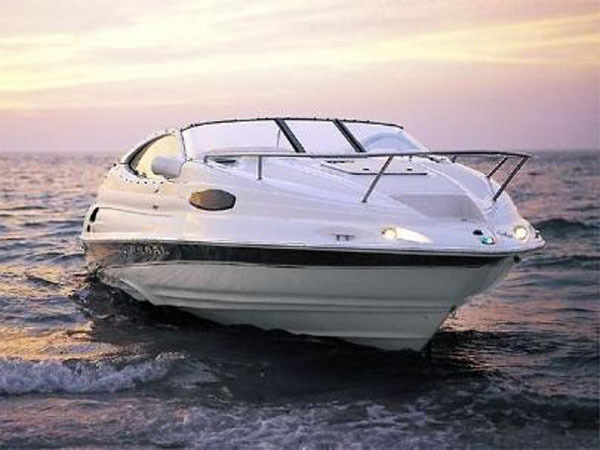 For anyone partial to twin hulls, try the Powercat 695. It is no secret that a well-sorted, twin-hulled boat tends to have the makings of an excellent fishing boat (see Twin-hulled powerboats: the advantages of power catamarans). They are more efficient, softer riding, more spacious, more stable, more manoeuverable and (when equipped with a pair of independently operable engines) inherently safer for offshore use than a single-engined monohull. They are of course more expensive to buy but the rewards (as in the case of Powercat’s 695) can be substantial. 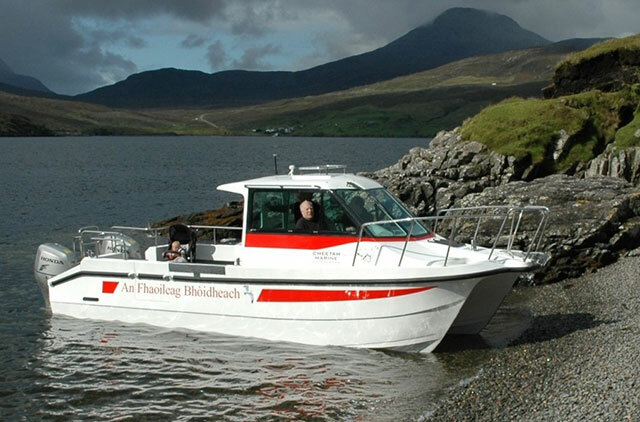 The Pursuit C310 is eminently suitable for use in UK waters. 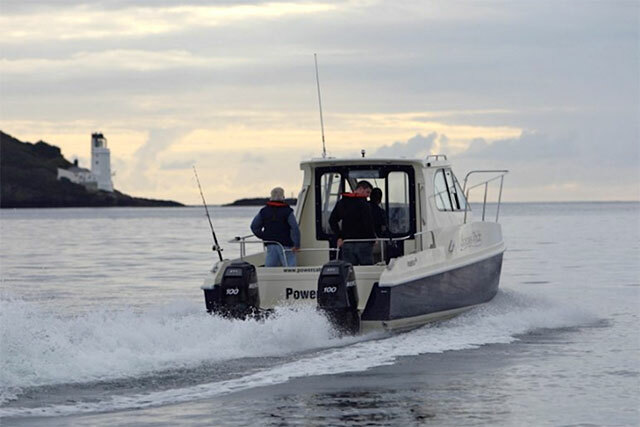 Pursuit is a very well respected boat builder – and while its Offshore 385 is an epic expression of how potent an offshore fisher can be, its C 310 is a more rounded and versatile fishing boat, more suitable for UK use. At 31 feet in length with a nine and a half foot beam, every bit of space on board this top-end Centre Console model is safe, secure and accessible. The hull is more acutely angled than most fishers but you still get that prodigious bow flare, plus a tank that will carry almost 1,000 litres of fuel. Fishing features include under-helm tackle lockers, a pair of drained, insulated, macerator-equipped fishboxes, a 200-litre baitwell, a slide-out tackle centre, a bait prep station, an insulated fishbox and a folding transom seat. Quality is outstanding and so too is the ride, with heavyweight build and a fine entry enabling you to spend long spells at sea without getting beaten up. It’s top-class stuff from Pursuit. 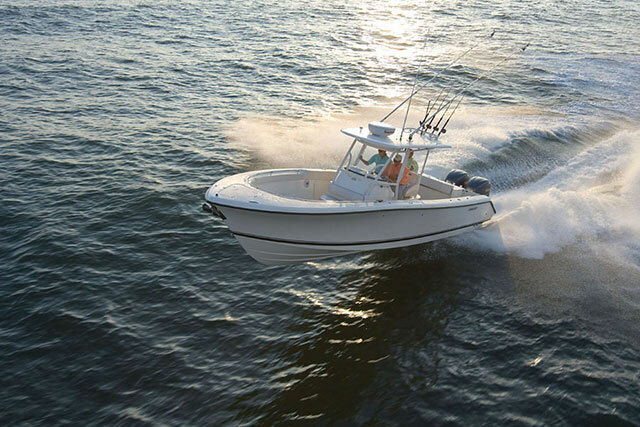 Top fishing boats: Cheetah 7.9 – built to uncompromising standards. 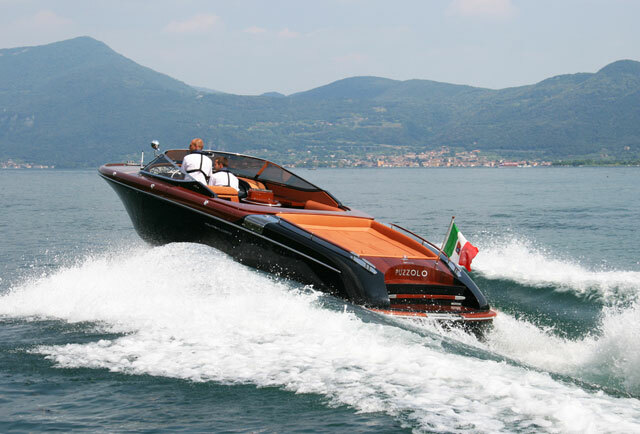 Cheetah is a boat builder much loved by commercial operators throughout the UK and you can see why. Founded in Ventnor on the Isle of Wight in 1989, it generates seven primary hull lengths from around six to 11 metres in length and all are built to the same uncompromising standards. 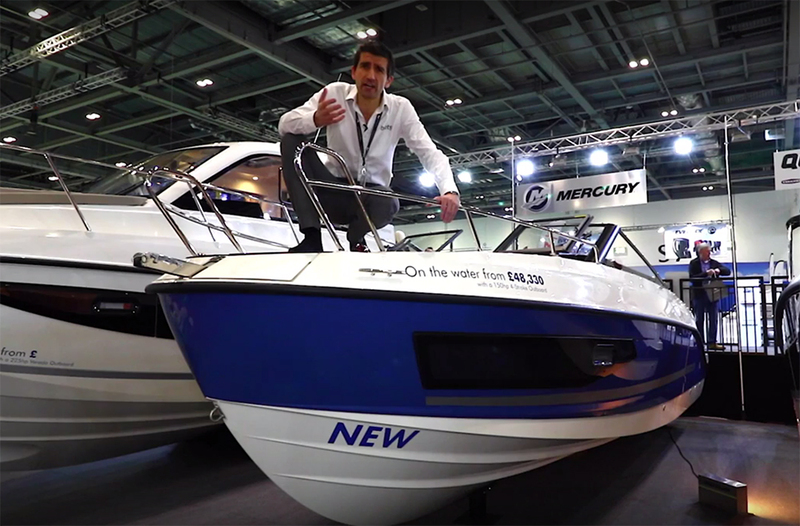 However, with a beam of 2.7 metres, the 7.9 is the largest Cheetah you can tow in the UK and for that reason alone, it is a boat the keen recreational fisherman ought to covet. Launched ten years ago, it offers great softness of ride and lateral stability, plus big load carrying capacity. And because Cheetah is set up to provide you with a bespoke boat tailored to the type of recreation you most enjoy, there is no need to make do with a configuration that doesn’t quite work for you. Just head for the Isle of Wight, talk to the factory and start making the most of the 7.9’s vast internals. 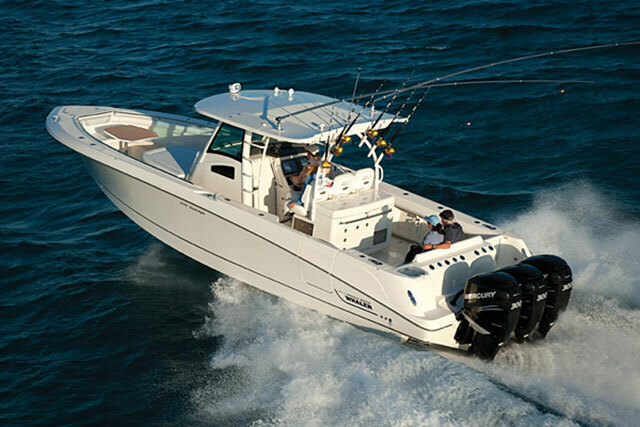 Top fishing boats: Boston Whaler 370 – a no compromise tool for fishing. 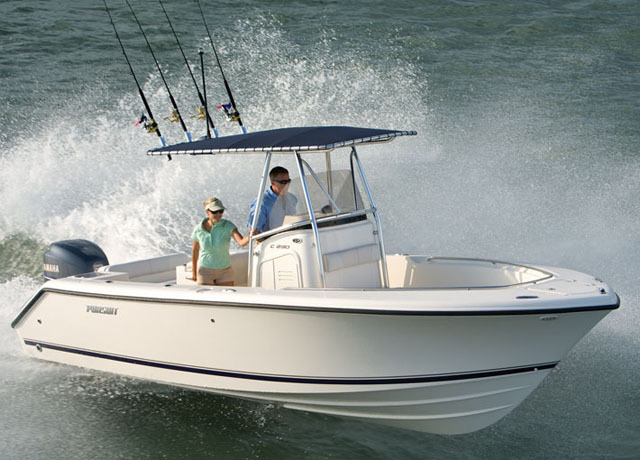 Boston Whaler is famous for heavily built offshore fishing boats. Its multi-award winning flagship, the 370 Outrage, is a remarkable distillation of the marque’s most fearsome assets. The aft cockpit comes with a leaning post as standard, plus tackle storage, a large livewell, a fridge, a freshwater sink and a grill. The central helm includes a fold-down standing platform and an electrically adjustable captain's seat and the bow provides lockable storage for your rods. Down below, the console cabin offers a proper two-man berth with a TV, a modest galley area with coffeemaker, fridge and microwave and a shower. Underway, it is everything you would expect of a Boston Whaler. Of course, you don’t need to equip it with the best part of a thousand horsepower; a more modest triple rig of 250s would do just fine. But either way, as a no-compromise tool for fishing, cruising and overnighting, it’s a splendid piece of work.